You can enjoy quality service and a great value with Education First Credit Union Checking and Savings Accounts. As a member, it’s easy to manage your Checking and Savings Accounts 24/7 through our Online Service options and other 24 Hour Convenience Services. As a member of Education First Credit Union you have many savings options available to you. Whether you are looking to save short term or long term, we are sure to have a product that is just right for your needs. To start your membership at the credit union a minimum deposit of $5.00 must be made into your Share Savings account. There are no monthly access fees associated with the account and you earn dividends on balances over $200.00. A Star ATM card is available with the account. Certificates are low-risk investments that you purchase for a set amount of time, anywhere from six months to five years or more. Your investment is insured by the NCUA (National Credit Union Administration) for up to $250,000. In addition, the credit union carries Excess Share Insurance which provides an additional $250,000 more in coverage. When you purchase a CD, you commit to deposit a fixed sum of money for a fixed period of time, and in exchange, we pay you interest. When you cash in or redeem your CD at maturity, you receive the money you originally invested plus any accrued interest. If you redeem your CD before it matures, you may have to pay an “early withdrawal” penalty or forfeit a portion of interest you earned. All CDs at the credit union pay a fixed interest rate until they reach maturity. An Individual Retirement Account (IRA) is a specific tax deferred interest savings program through which a member may save for retirement. Qualifying members receive the benefit of deducting their IRA contributions from their taxable income and deferring tax payments on the interest earned on their deposits until the IRA funds are withdrawn (check with your tax advisor to determine if you are eligible for this special deduction). We offer IRA Savings Accounts and IRA Certificate Accounts. 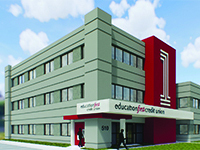 Education First Credit Union offers an excellent Money Market Savings Account. This account is ideal for our savers who need to keep their funds liquid. Understanding your savings needs and plans is important, so we can direct you to the products and services that can help you earn more, save more, or utilize the various ways to manage your accounts more conveniently. The minimum opening deposit for our Money Market Savings is $1,000.00; dividends are compounded and credited monthly. Why don’t we get your new Money Market Savings Account opened today? Education First Credit Union offers Health Savings Accounts, a new type of deposit account that lets you save tax-free for medical expenses. To be eligible for an HSA, you must participate in a high deductible health plan. This account has no monthly maintenance fee, no set-up fee and no minimum opening deposit. The account pays interest at a tiered rate based on the account balance. We have one of the best H S A accounts anywhere. Please compare before you choose another provider. Our rates are excellent! Even better than many of the large banks. The holidays can often be very hectic and stressful. Planning ahead and being prepared for the extra expenses that come with the holidays, can be extremely beneficial. Education First Credit Union offers a special holiday savings account for our members. This account allows members to save money during the year and have it made available to them on October 15th. Deposits can be made into this interest bearing account through payroll deduction, over the counter or through the mail. Once you signed up, enrollment for next season is automatic. Why not start your Holiday Savings now, and you will be ready to fully enjoy the season! We want to see young people get started out right in their financial life. And, they can do so with our Teen Advantage Club Account. It is specially designed for members who are between the ages of 13 and 17. To be a member of the Teen Advantage Club you must first open a Primary savings account with a minimum opening deposit of $5 and then you have to deposit at least $1 into the Teen account. It’s that easy! For members between the ages of 16 and 17, we feel you are ready to take on a bit more responsibility. (With qualifying parent or legal guardian) The account has some added features for you. The child must be a member of the credit union with the minimum $5.00 in the primary savings account. Dividends are paid on every dollar in the ABC Advantage Account. Dividend rate is the same as the Primary Savings Account. – Opening the account (1). – Birthday (card will be mailed along with one apple buck). – One per every $10.00 deposit (within a given month) with a maximum of five apple bucks per month (maximum 62 per year). -Apple Bucks will be used to “purchase” gifts at which time the Apple Bucks will be surrendered. – At the age of 13 the account becomes a Teen Account and the certificate will remain unchanged. A checking account is a deposit account for the purpose of securely and quickly providing access to your funds on demand, through a variety of different channels. Checking accounts offer personal convenience because you can access the funds in your account by simply writing a check, conducting a debit card transaction, using an ATM, Online banking, CU Access, Bill Pay service, or visiting a branch. You can deposit or withdraw any amount of money any number of times, subject to availability of funds. For a copy of the Truth And Savings Disclosure please click here. Not all members will qualify for a checking account. 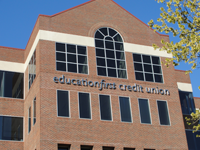 Education First Credit Union reserves the right to refuse to establish any checking account service based on previous or other account performance. Education First does not charge a fee for the use of our mobile banking service. Depending on your service data plan, you may incur web charges or text messaging fees. Check with your mobile service carrier to get more information. 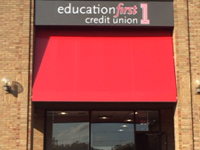 Free & Unlimited transactions at Education First CU ATMs. Four free transactions at all other ATMs per month. $2.oo per withdrawal over 4.